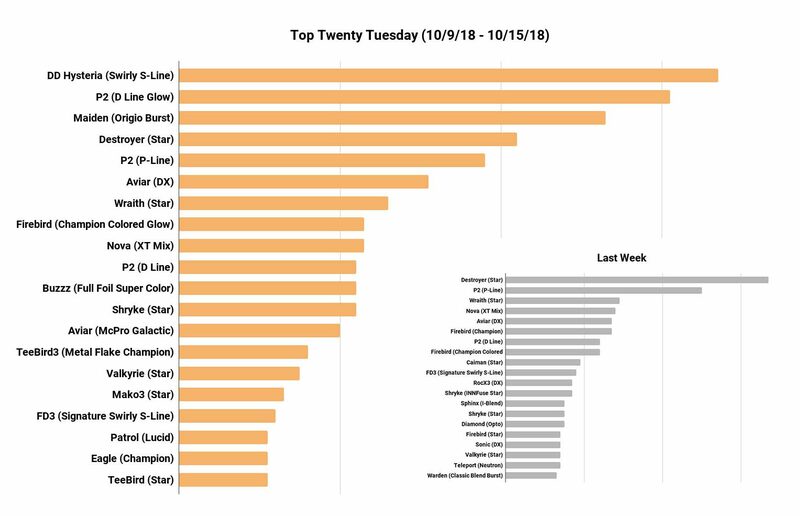 We’re happy to present the weekly blog post called TOP TWENTY TUESDAY which is intended to let you know about the short-term sales trends for discs. We’ve regularly published different best-seller lists for the quarter, or for the year, etc. But sometimes it is fun to look at what the hot sellers are for a short period of time. In this case, we’ll show the sales figures from the previous Tuesday through the most recent Monday. Basically, you’ll be seeing the best-sellers for exactly the last week of sales at Infinite Discs. New discs will likely spike in the chart, and it will be fun to see which discs keep up the pace, and which long-term sellers appear week after week. These will also be broken down by plastic types, so the same model can show up in multiple plastics. There are a couple of interesting things on this week’s chart when compared to last weeks chart (CLICK HERE for last week’s chart). Discmania had two new releases which shot straight to the top with the Swirly S-Line DD and the Glow D-Line P2 (Halloween Edition). New releases will usually shake up the weekly chart, since they get a boost in sales just by virtue of being new. Thus, the Star Destroyer and regular P-Line P2 dropped to those new releases. Also, we got two of the Trilogy Challenge discs in stock this last week, and the Origio Burst Maiden putter sold out almost the same day it was added to our website. The Lucid Patrol is also selling well as one of those Trilogy Challenge discs and made it onto the chart. Full Foil Super Color Buzzz discs are continuing to get spikes in sales from time to time as people collect the different stamp designs. –> Each week we’ll invite you to leave a prediction for a certain chart position on next week’s TOP TWENTY TUESDAY report. The first three people to predict that chart position correctly in the comments will win a $15 gift card for the Infinite Discs website. The winners from last week’s guessing are Steven Bidigare and Joe N, who both predicted that the D-Line P2 would slide to the 10th position. Congratulations! GIFT CARD PREDICTION FOR NEXT WEEK: Guess the #8 spot for next week’s chart! Star Destroyer finds its way up to 2nd! D Line P2 at number 8! Nova XT, why not copy PM.